The key to importing information into Innoslate is the automated import feature called 'Import Analyzer.' You will now find separate tabs for each type of file with stepped walkthroughs on each tab to guide you through the process to successfully import that particular type of file. 'Import Analyzer' is designed to handle importing/migrating entities of any class from Microsoft Word (.docx) files, importing previously-exported Innoslate (.xml) files, importing/migrating entities of any class from Microsoft Excel (.csv) files, importing/migrating entities of any class from Plain Text (.pdf, .txt, etc. ), and importing/migrating entities of any class from UML/SysML (.xmi) files. From any view on Innoslate, open the 'MENU' drop-down, located on the top navigation bar and click the 'Import Analyzer' menu item. 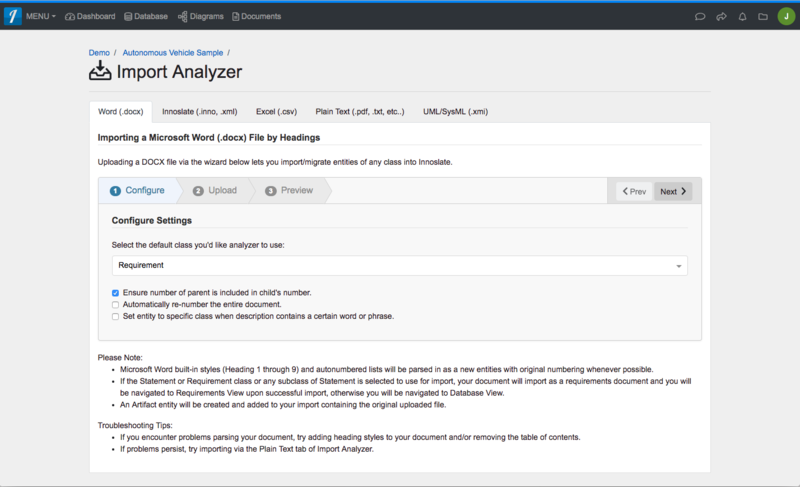 Importing a Microsoft Word (.docx) Files You can import a Microsoft Word (.docx) file into Innoslate. Importing a Microsoft Excel (.csv) Files You can import a Microsoft Excel (.csv) file into Innoslate. Importing an Innoslate Export (.inno, .xml) Files You can import an Innoslate Export (.inno, .xml) file into Innoslate. Importing Plain Text (.pdf, .txt, etc.) You can import Plain Text (.pdf, .txt, etc.) into Innoslate. Importing UML/SysML (.xmi) Files You can import UML/SysML (.xmi) file into Innoslate. The key to importing information into Innoslate is the automated import feature called ‘Import Analyzer.’ You will now find separate tabs for each type of file with stepped walkthroughs on each tab to guide you through the process to successfully import that particular type of file. ‘Import Analyzer’ is designed to handle importing/migrating entities of any class from Microsoft Word (.docx) files, importing previously-exported Innoslate (.xml) files, importing/migrating entities of any class from Microsoft Excel (.csv) files, importing/migrating entities of any class from Plain Text (.pdf, .txt, etc. ), and importing/migrating entities of any class from UML/SysML (.xmi) files. From any view on Innoslate, open the ‘MENU’ drop-down, located on the top navigation bar and click the ‘Import Analyzer’ menu item.